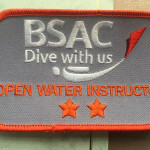 Congratulations to Richard Dew who recently earned his Open Water Instructor pips following his successful Practical Instructor exam.When you have passed both the Theory Instructor and Practical Instructor national exams, you become a fully-qualified BSAC Open Water Instructor.A few years ago Richard told his wife he was just going to do a short diving course... and now look...Well done Richard. Excellent training day at Arlesey with barbecue and lots of sunshine. Mid Herts Divers garments with embroidered club logo: Rugby Shirt £24 Polo Shirt £14 Zip Hoody £22 Beanie Hat £6 Other items available on request. Order today with your size and colour choice.